Pacific Ocean at your back door, close to town and shops. This property is about as close as you can get to the beach with the pacific ocean as your backyard, the sand is just metres from your back door, giving you spectacular views of the beach and ocean. There are 3 bedrooms with stunning views from the master, 2 lounge rooms, large dining room, 2 bathrooms, full kitchen, and your own private laundry. Enjoy a BBQ in your own private patio while you listen to the surf. Korora Bay Beach House is a spacious, modern three bedroom townhouse with absolute beach frontage, situated just 25 metres from beautiful Korora Bay. That is just 25 metres to the sand. 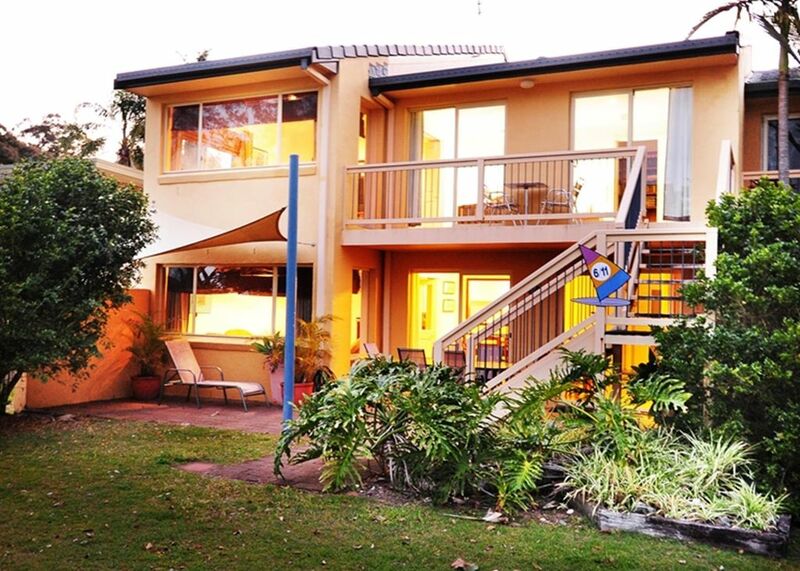 Just 5 minutes north of Coffs Harbour City Centre in beautiful Korora Bay. Situated on the edge of the Marine National Park with the Solitary Islands as the backdrop.The views from the property are simply fantastic, the beach is literally on your doorstep. Korora Bay Beach House has undergone a complete renovation, completed november 2012 and the results are stunning. The townhouse has three bedrooms, separate dining room, 2 lounge areas with flat screen televisions, two bathrooms and laundry facilities. Upstairs has all the bedrooms, large bathroom, lounge room, large book library and 2 balconies with great views. Downstairs has lounge room, dining room, bathroom, laundry, large kitchen and small sitting room which can be used as 4th bedroom with a fold down sofa bed. Does not have doors to close off to living area. The property is very well appointed and offers a totally relaxing beach holiday for families, groups of friends or couples. Korora Bay Beach House is a beautiful town house in a peaceful residential area and all guests are asked to be respectful of the home and also the nearby residents. Weddings, hens/bucks nights, schoolies bookings or parties not permitted and all bookings are subject to terms and conditions which are available on our website. If your in doubt please ask before booking. Property address and key collection details are sent on confirmation of your booking. Please note Korora Bay Beach House is not pet friendly. We stayed at Korora beach house over Christmas, the residence was okay but could do with some work, fridge and freezer need updating, upper deck needs maintainance, ceiling fans and lights downstairs looked like they needed an electrician as the lights would turn on and off at times. No wifi, which is practically a mainistay nowadays, you could have it if you paid for it. Overall it was adequate for the time we stayed there. A bit out of the way from the hub of Coffs - Park Beach and Jetty, however that's the feature and pleasure of it. Just need to pop into town for supplies as there's no shop close by. Easy access to the beach and coastal walking trail. Well equiped property with heaps of room and bedding, two living areas, two bathrooms anda large bookcase with plenty of reading materials. This property was right on the beach with great views fronm the top floor. The master bedroow was fantastic, the other 2 very comfortable, tho' nothing special. The pool is shared with other apartments but was always empty during our stay, so quite exclusive.There were 3 living area's, the kiltchen was fairly well equiped. Th eBBQ needed aclean before we could use it. Otherrwise a great property.